I’ve been looking at Pinterest a bit more recently and I stumbled upon lots of ideas for using hoops for movement play and dance. You might think that hoops are just for swinging around your hips or limbs, but there are lots of things to be done with them. 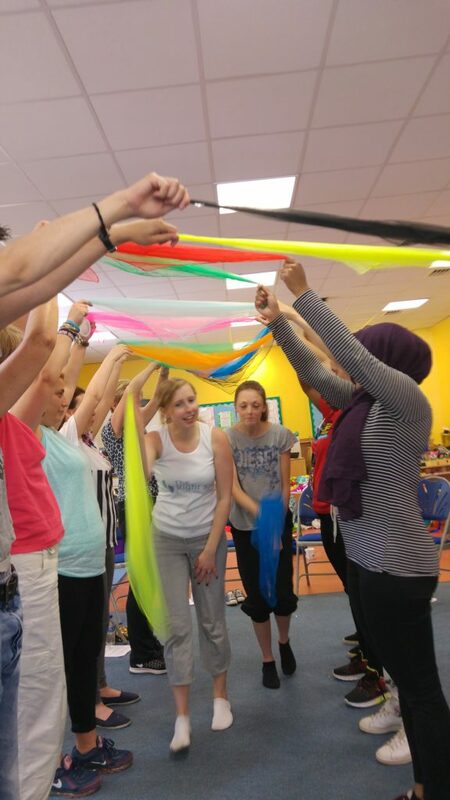 Not just big, gross motor skills movements, there are a few ideas for more intricate movements and team building too! Hoops are not just for children and some of the ideas below can be adapted for our Active Armchairs classes. Hoops were very popular in the past and this could be a nostalgic prop that leads to lots of great conversation. You can get hoops online and in many toy shops. They range in price and some of the more expensive ones even count how many times you swing it around. For the following ideas you just need simple circles, but do try and get some variation (different colours and sizes are great for tactile stimulation) and, if you’re using them with lots of children a lot of the time I’d recommend sturdy ones or you will end up replacing them very soon when they bend. If you want to be extra exciting you could get light up hoops, glow in the dark hoops or glitter hoops (Amazon). You can also buy travel hoops. I’ve not tried them myself, but they might be useful for a traveling dance teacher who already has a lot of props in the car! 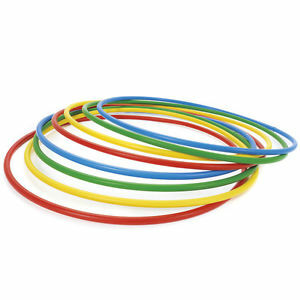 You can make hoops into all sorts of shapes, both on the floor or standing up, and you can keep them there by using tape. A wobbly climbing frame can be good for an adventure dance (see my improvisation blog for more on this) and has an extra element to the ones played with outside as they have to be careful not to squash it or wobble it too much. Tape the hoops together in a few places and use one on the floor to keep it sturdy for something 3d or make patterns on the floor for games like hop scotch, Lilly pads or islands. I love a magic door adventure… they can go anywhere and any when, they can go to real or imaginary places, they can take you through as you or someone/thing else and they can take one person or a team. You can use lots of different things to make a magic door because you just need to create a shape to walk through. Hoops are great if you want to send the whole class through because the teacher can hold them on their own and send themselves through afterwards. You could use a hoop as a floor magic door or a standing one. You could have a different colour hoop for a different adventure. This is good for in a classroom, during Active Armchairs, in small group time or in a hall based dance class because it’s very adaptable. It is also good for all ages and abilities. Each pair or group has a hoop and they sit cross legged around it. The dancers have to work together to lift the hoop, stand and end with the hoop above their heads. This can be made more difficult by using fewer and fewer fingers, starting from laying down or using a time limit to speed them up. It can be made simpler by starting from a crouch or chair and using more fingers. Create stations around the room as you would in ‘normal’ circuits. Different hoops could mean different things and you can position the hoops on lots of ways to signify what needs to be done at each station. Here are a few ideas to get you started, but circuits is always easily adapted to the class theme. 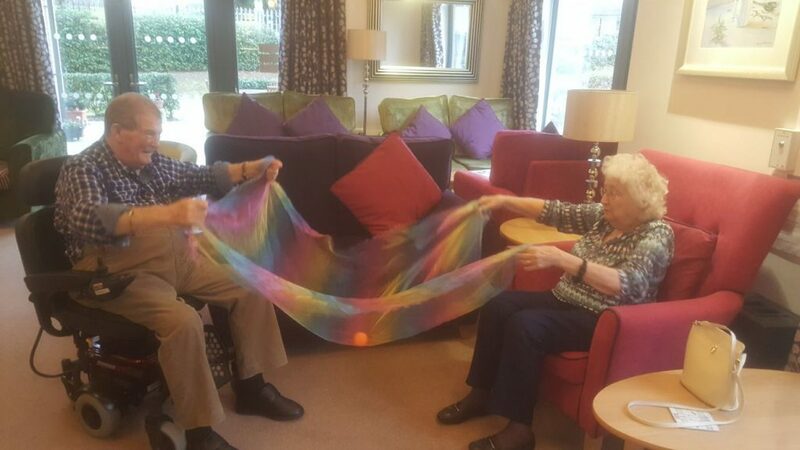 Not the circle dance we offer to care homes, this is literally choreograph a dance about circles! This idea can also be used at any age, for any ability. Use various techniques to help the dancers create movements that are circular both with and without the hoops, in them and around them, holding onto them and not. 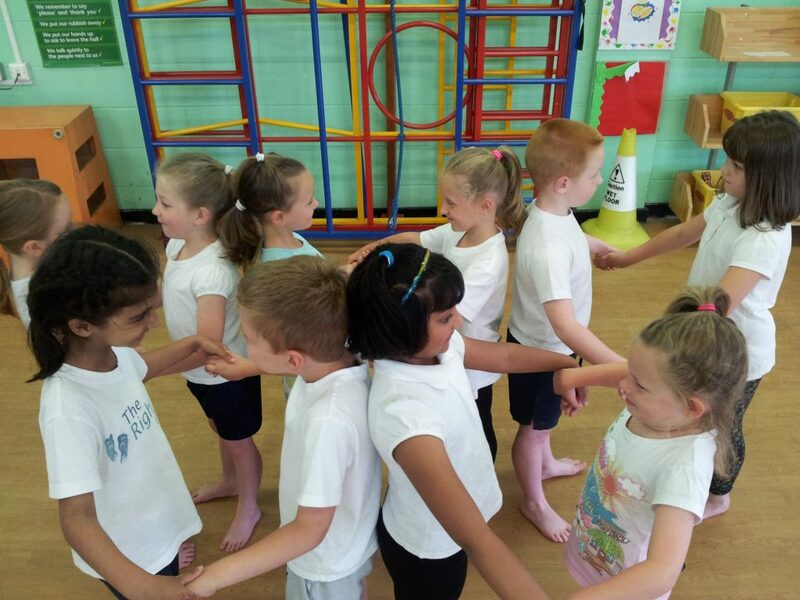 The circular movements are likely to be large and therefore developing gross motor skills. This is great for improving muscles needed for writing. 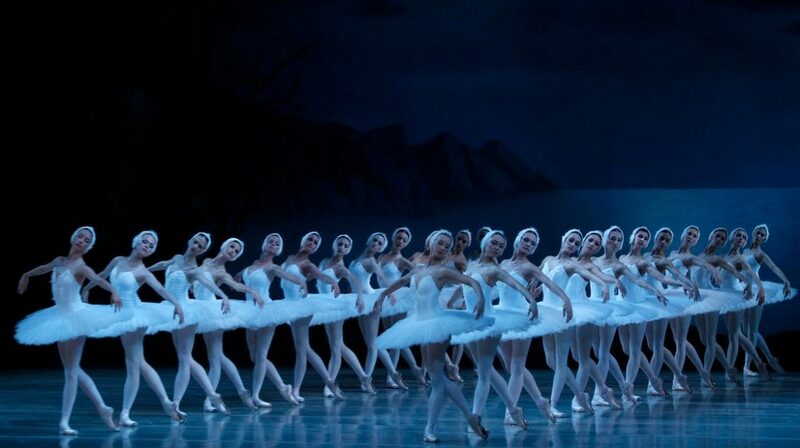 Try sequencing the movements into a motif and then developing them into a full choreography. The hoops make great backdrops and can be positioned on the floor to encourage interesting ways of travelling between motifs. There is a lot of fun to be had with this idea and all the ideas above could be used yo influence he choreography. I’m going to be writing more blogs about props ideas, but in the meantime, if you want to read more about props you can see our Facebook page (Each month we share some ideas about props on Facebook) or click on the ‘props’ link below and it will show all of our blogs relating to props. Make some Valentine’s Day themed dance props! We had a lovely time making them and playing with them since. I’m not going to tell you how to make these things as there are lots of tutorials online about that already, but I would like to share some thoughts and ideas about what we did. This is a fantastically versatile prop. You can change the size (imagine a massive one for team work! ), the shape (small hand held ones for dancing with), the content and the colour (red gel food colouring was pretty) so they could fit almost any theme. These are a wonderful thing for Active Armchairs. 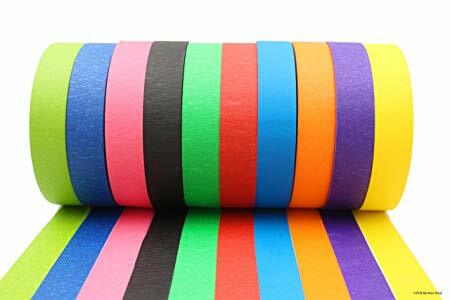 For all the reasons they are good for sensory stimulation, but also because they are unusual, not patronising (providing the contents is appropriate) and they brighten up the room. We only had jars for this, but I do think plastic screw top bottles are better. The jars look very pretty, but they are a little heavy and might break if dropped. When making them hand eye co-ordination and fine motor skills were developing. You can dance with them, copy them or move after them as they roll away. Play a version of eye spy and use the things in the bottle as inspiration for choreography. I used an A4 bit of card and let Tiny One choose how to decorate them. We used crayons, stickers and paint. We could have made smaller ones and turned them into wands! They are also very versatile as shape, size, colour, decoration etc. can be changed. The texture of the puffy stickers is a nice addition to the game. Other textures could be used as well. They could also be used for aiming or landing pads and this would be fun for Active Armchairs. This would be a lovely thing for a cross-curricular approach. 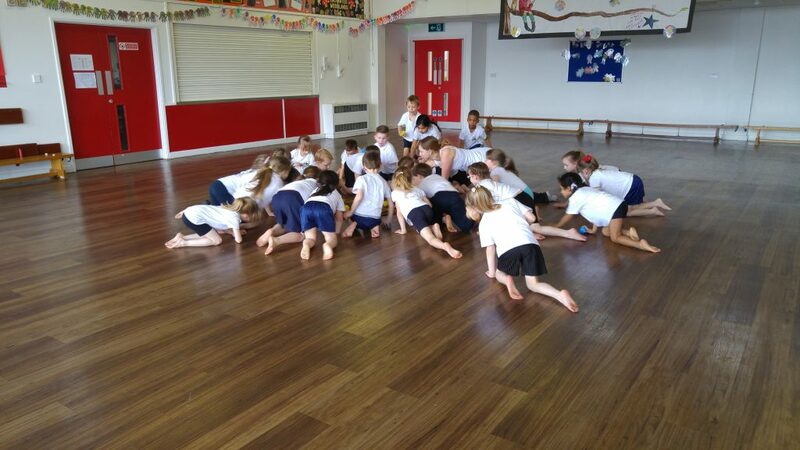 Each child in the class could make their own and they can bring them to dance as a magic spot or as part of a larger thing such as a long snake of hopping stones. I enjoyed this challenge so if you have one to set us please get in contact and we’ll see what we can make! Fine Motor Skills: these are smaller movements making use of smaller muscles, most commonly in the hands. Movement examples would include clenching a fist, wiggling toes or using tools such as cutlery or a computer mouse and keyboard. 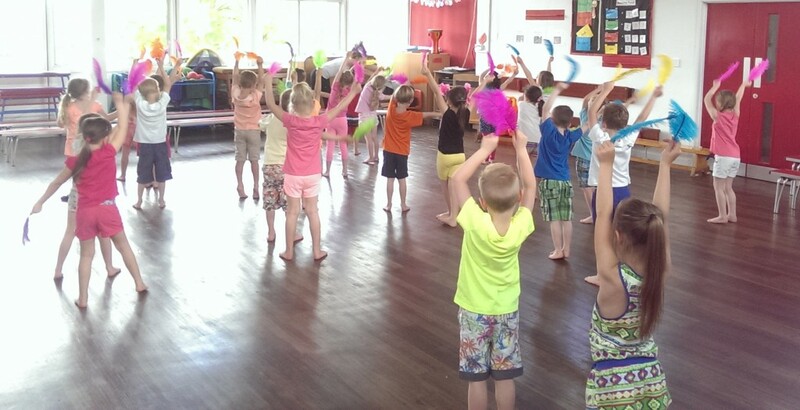 In dance props are our main source of support in fine motor skill development and maintenance, but there are things that can be done without. 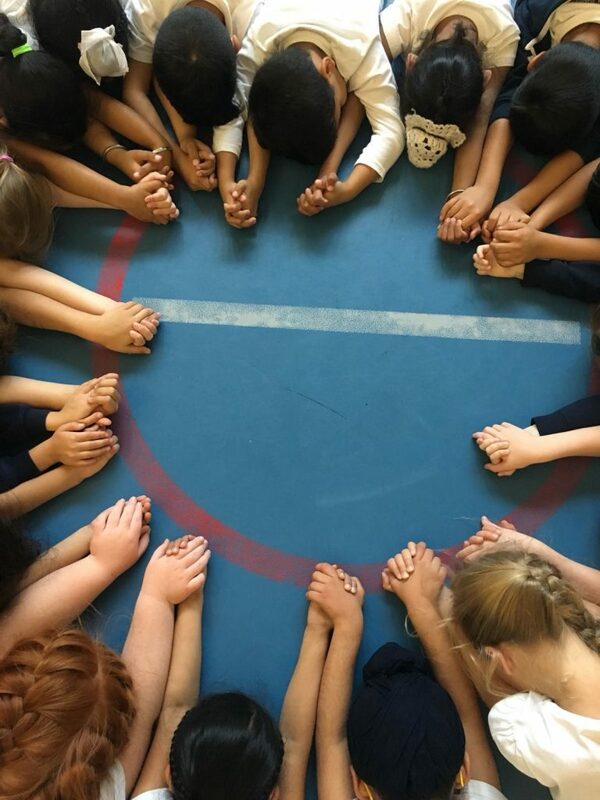 When working with children in an Educating Dance (cross-curricular) class small gestures are wonderful at conveying meaning. I used them in our Dinosaurs themed classes when doing a warm up about excavation and fossils (see photo below). 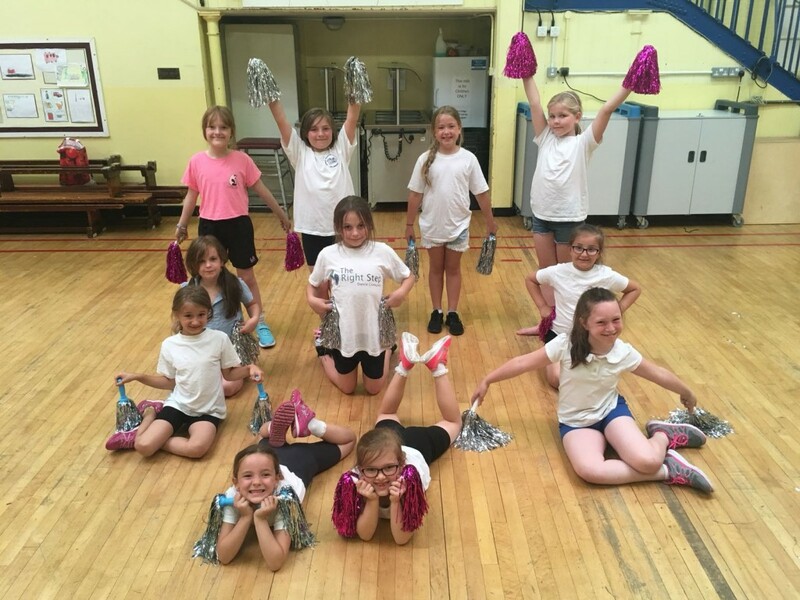 A dance club as a whole can also be a good opportunity for practice as participants often have to get changed and therefore use buttons, buckles and laces. In our Active Armchairs classes we do the finger count in our first warm up dance. 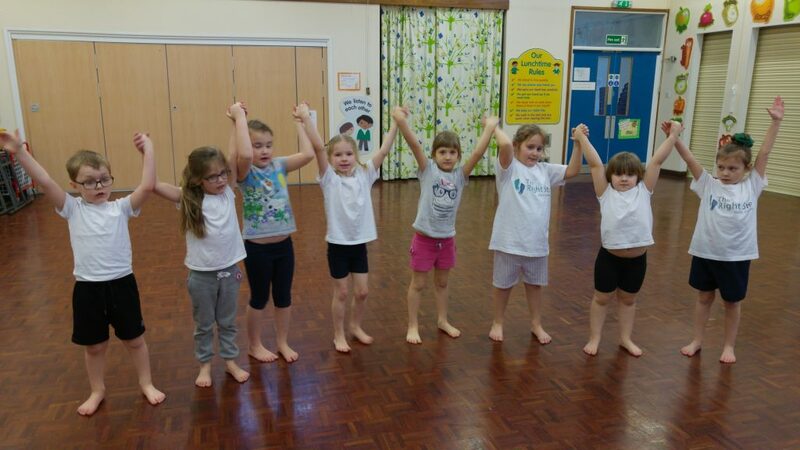 This is predominantly about the opening the lungs (we shout our counts as the fingers open), but it is also great for fine motor skills, the circulatory system and generally waking bodies and minds for the class. It is one of the few essential movements that are found in Active Armchairs sessions, though the TRS Teachers still put their own spin on it. 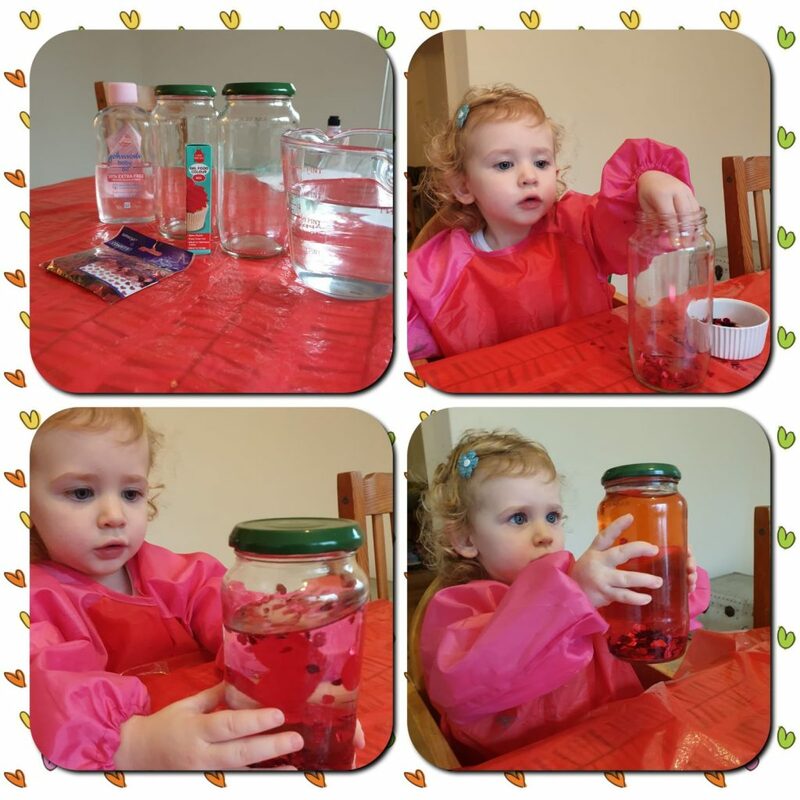 Props make development and maintenance of fine motor skills much easier. Simply holding a relatively small object is beneficial. 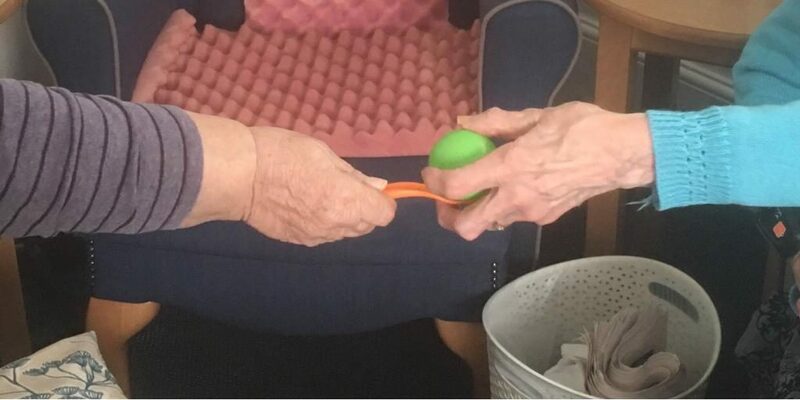 Squeezing balls or egg shakers (the TRS Teachers have hundreds of these between them) takes the benefit to the next stage. I have a fun trick with scarfs where by you screw it up into one hand, hiding it away, then slowly open it to make a rose. Fine motor skills, like gross motor skills, are key to freedom and self worth, but in different ways. 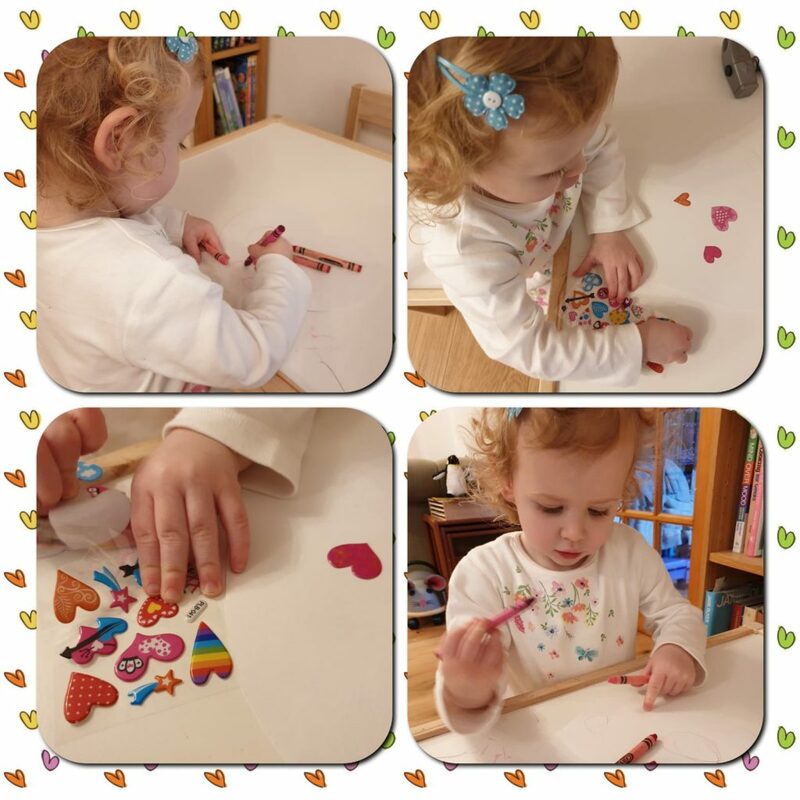 Fine motor skills allow someone to press buttons, write and draw, point and make signifying gestures or sign. Without them, as with gross motor skills the ability to perform simple tasks is lost. Children have a sense of excitement and pride when they receive a pen licence. 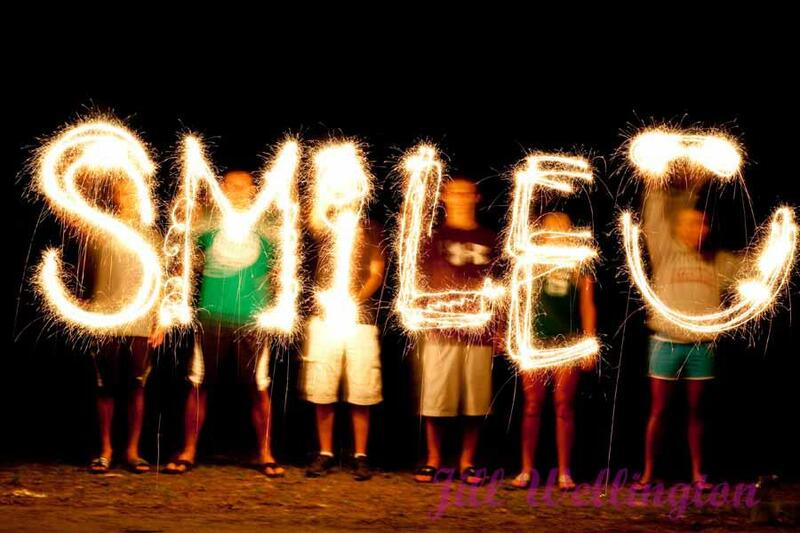 An adult who can write down or draw their thoughts is able to express themselves artistically. 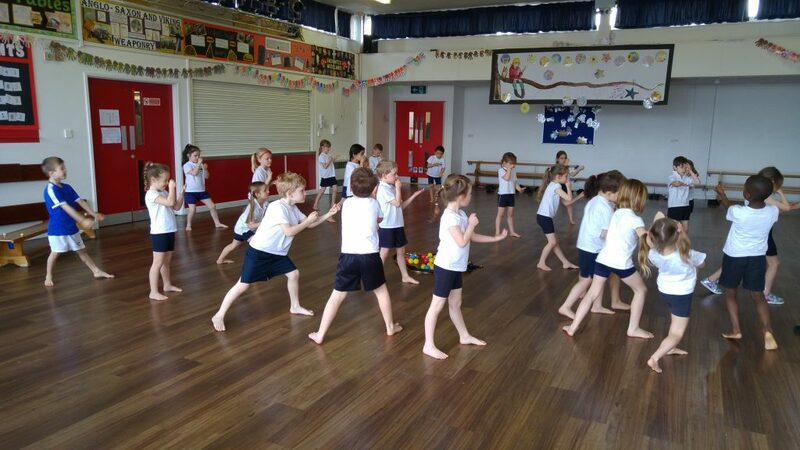 The next section is How to Maintain and Improve Motor Skills With Dance. 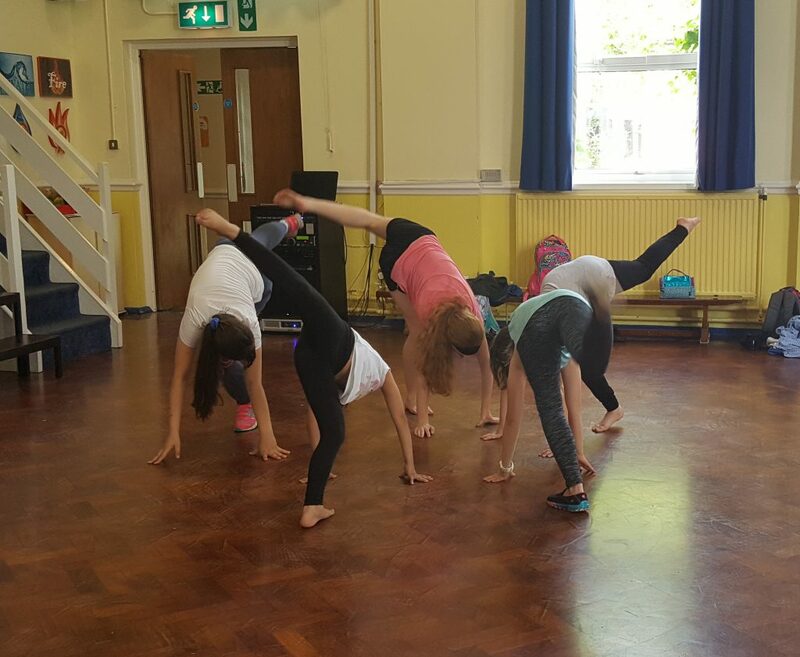 Motor skills involve actions using muscles and, as this is an inherent part of dance, it is important that we know about them and how our teaching can affect them. There are two types of motor skill and both are very important for development and maintaining freedom. In this blog I’m going to explore each type, how we use them and how props can be used to great effect. It got a little bit detailed so I’ve split the post into three sections. 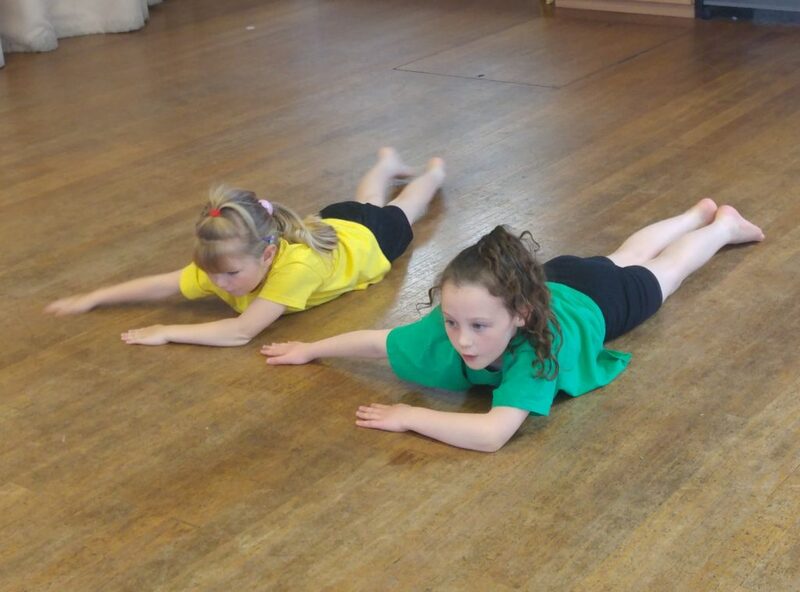 Gross Motor Skills: these require the larger muscles, whole body movements and core stabilising. 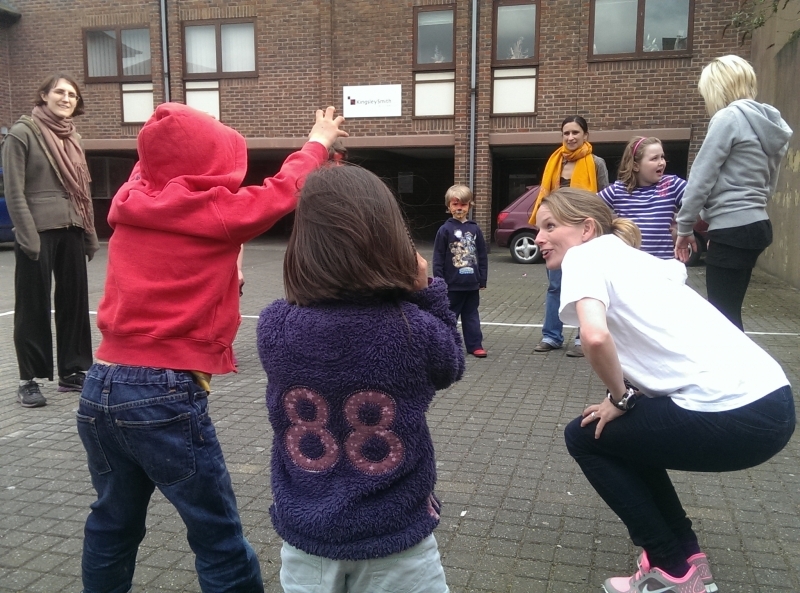 Movement examples include walking, jumping and rolling as well as hand eye co-ordination such as throwing or catching. 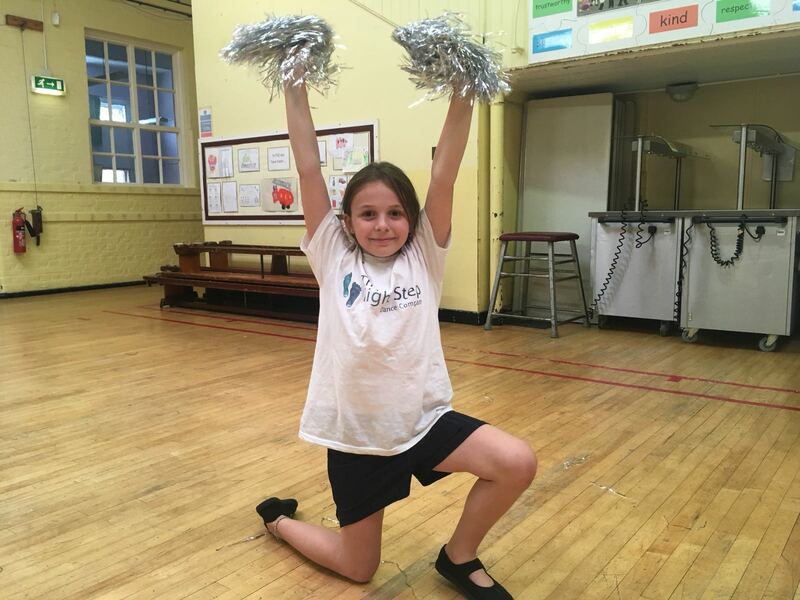 The gross motor skills are easily developed in a dance class with children and young people and when our youngest participants are left to move as they choose (see my improvisation blog), they will naturally choose to move in a way that develops their movements in the way they need. For example, 2 and 3 year olds can often be found with their heads on the floor whilst standing. This is a key part of their development and they do it without encouragement. 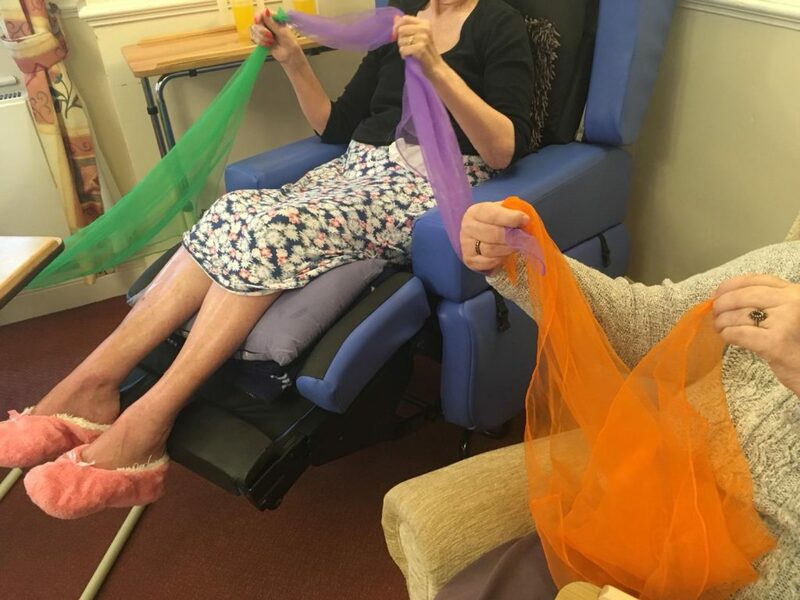 In Active Armchairs we need to give a little encouragement and provide opportunities for gross motor skill use. 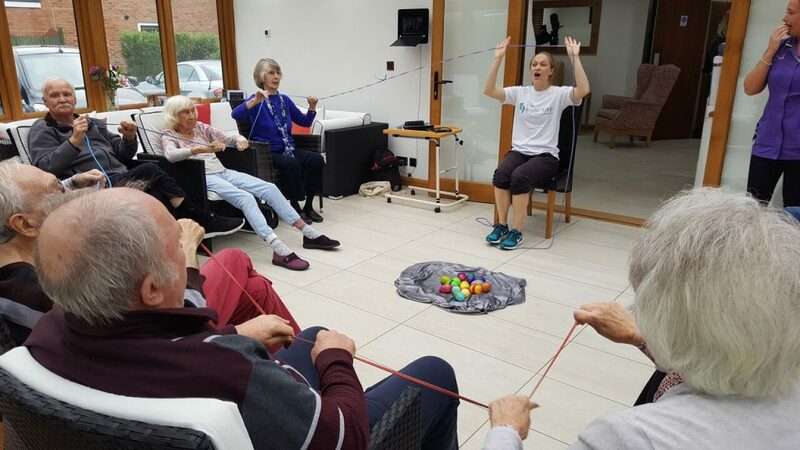 This is because the majority of our participants have reduced mobility, they might be nervous to produce large movements or they don’t believe they can do any large movements. A key part of Active Armchairs is that the smallest movement counts, but we still give everyone the choice to use larger movements if they feel able that day. For the majority of movements choices and alternatives are given. For example, an arm circle can be performed from the elbow or wrists. Some people prefer to just use the shoulders, but not the arm. 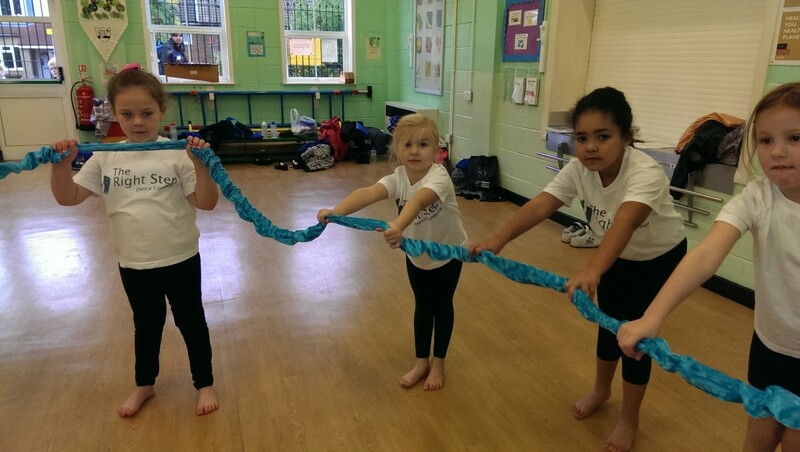 We use props to encourage people to do larger movements and develop their gross motor skills. For example, when giving someone a scarf they almost always wave it. This is a movement that involves the larger muscles of the arm and, even when sitting, core muscles are needed for stabilisation as well. 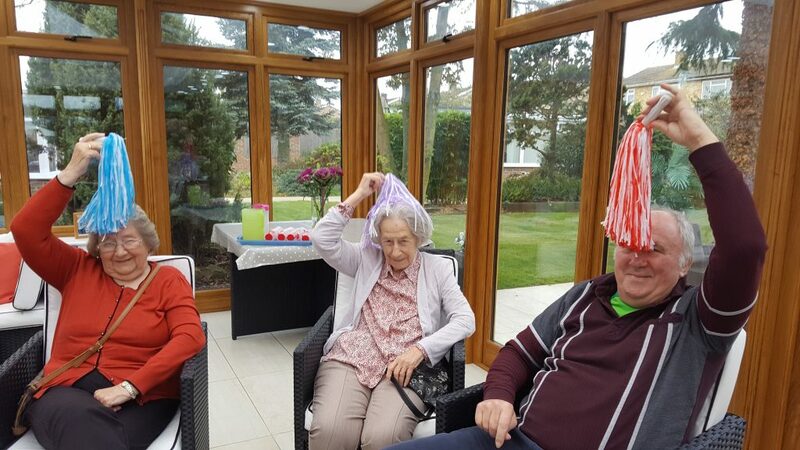 The scarf often makes people do larger movements than they would without it and they rarely realise this is the case because they are enjoying themselves. 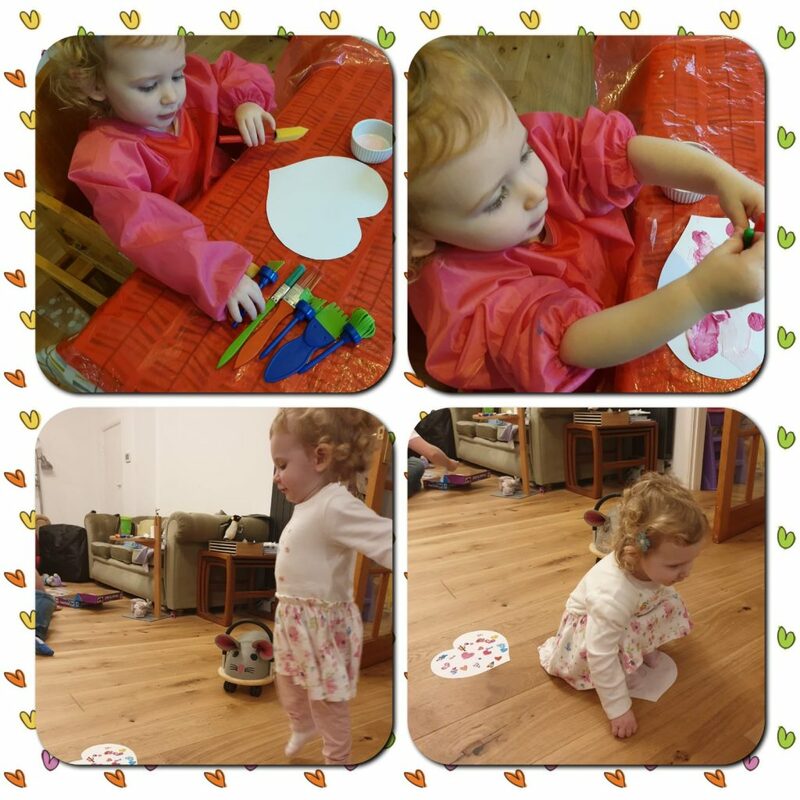 We are always careful to keep an eye out for fatigue though because using props for gross motor skills is tiring. 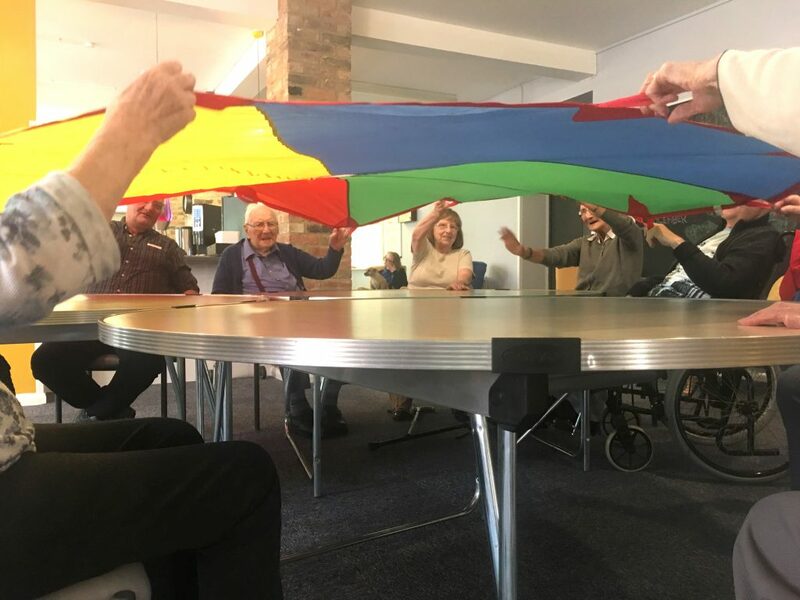 Other examples of props that have a similar effect are large pieces of material used for partner work (see photo), giant elastics, balls and bean bags (for throwing and catching rather than hand work), rhythm sticks and parachutes (see photo above of Active Armchairs at Age UK Folkestone). Why are gross motor skills important? They are needed for everyday movements such as standing, walking, getting dressed and lifting a kettle. These are known as Activities for Daily Living (ADLs) and are essential to keeping freedom. As someone’s ability to undertake the ADLs decreases, so often does their freedom. This can be devastating as it can affect choice, individuality, self care and self confidence. 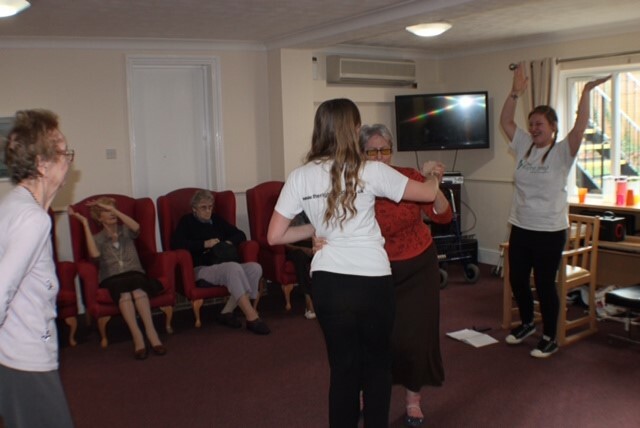 Gross motor skill maintenance is a key part of our social dance classes. Often, by the time we are in Active Armchairs, much of this ability has been lost. There are fun things that can be done though. The third section of this motor skills series has lots more ideas for you. 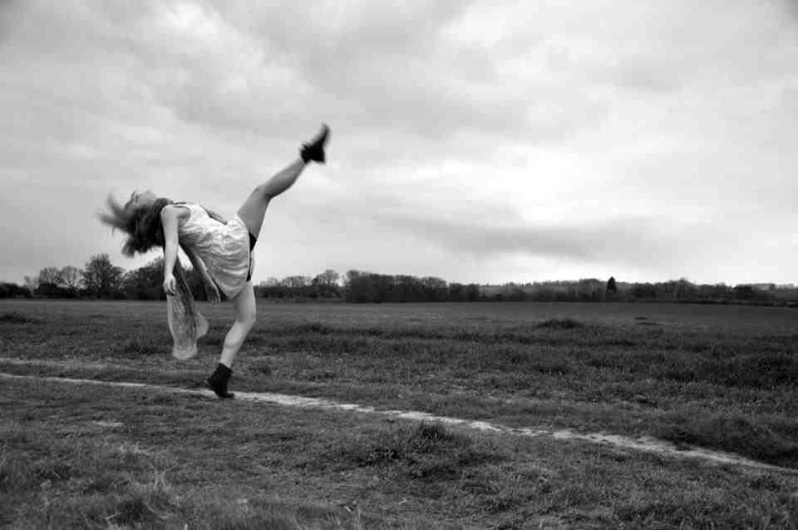 Gross motor skills are also key for some things that might be a little more unexpected such as writing (click to read my blog about ‘The Dancing Day’ for more about sky writing), screwing a lid on a jar or using scissors. This is because it is important to maintain the correct posture when completing these tasks. If gross motor skills aren’t developed early on, problems with writing and therefore academia can follow. 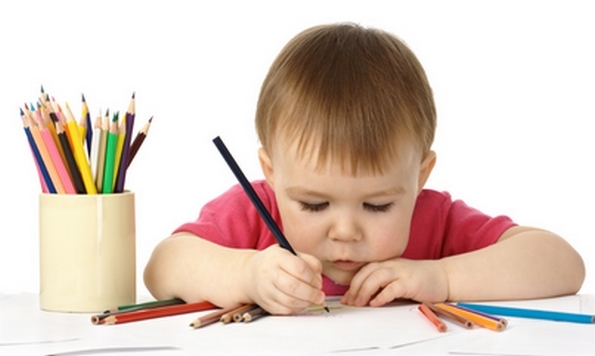 At the same time, gross motor skill development can have a positive affect on handwriting. The next section of my blog will be about Fine Motor Skills. Written by Rebecca, Georgia and Jess. 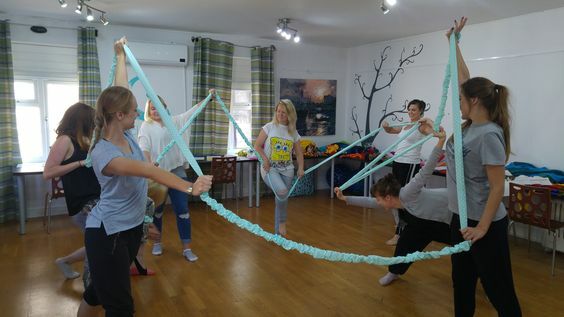 The TRS Teachers gathered for a props sharing to discuss ideas for using props in the dance class with different age groups and in different settings. The sharing was a great success and not only did we all come away with lots of ideas, we also made some props together such as egg shakers and a giant scarf. During the the sharing we explored different ways to use the props we had made and thought of ways we could use these as a way to engage participants and to enhance the dance class. 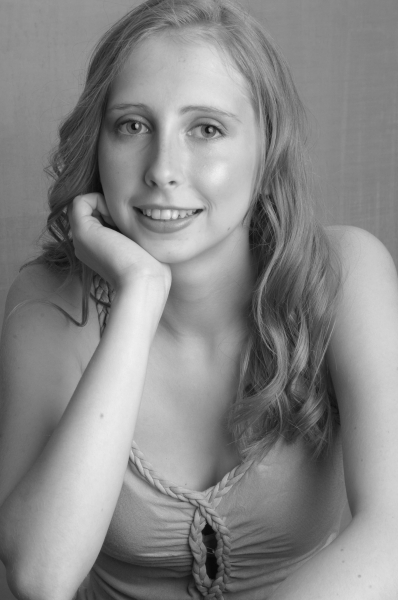 I have recently started teaching in different environments and with different age groups. This has made me think about the way I can incorporate props into my classes. 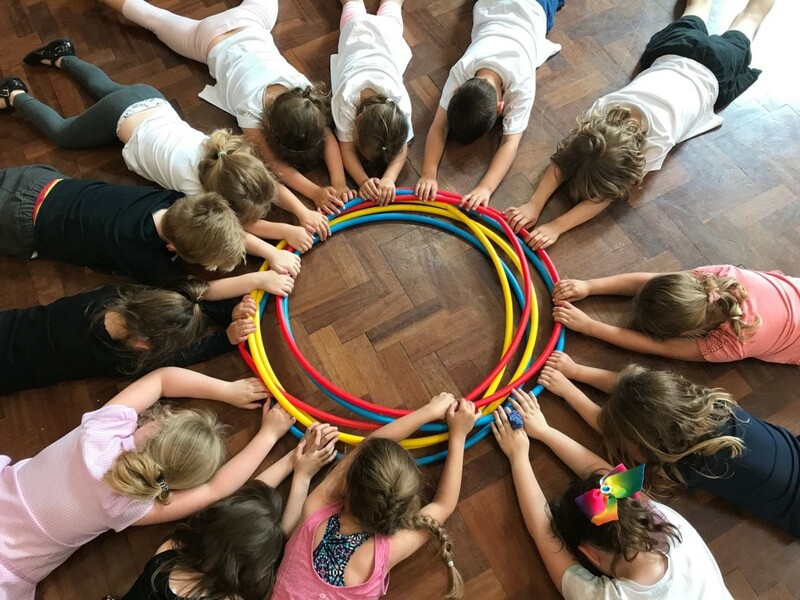 Not only can props extend the movement and can help tell a story, they can also help participants interact with each other and with me, as their teacher, creating new bonds and friendships within the group. The sharing gave lots of ideas for how to make props and use them in classes in different ways. Props never just have one use, with a little imagination a scarf can turn into anything. The sharing provided lots of ideas of how to make props and use them in classes in different ways. We created a prop shopping list that included teacher’s favourite props. Some of them are the basics that every TRS Teacher needs! At The Right Step we love to share great practice and this is what the sharings are about, but we found the props sharing was also very therapeutic. Conversation and craft in a relaxed atmosphere. 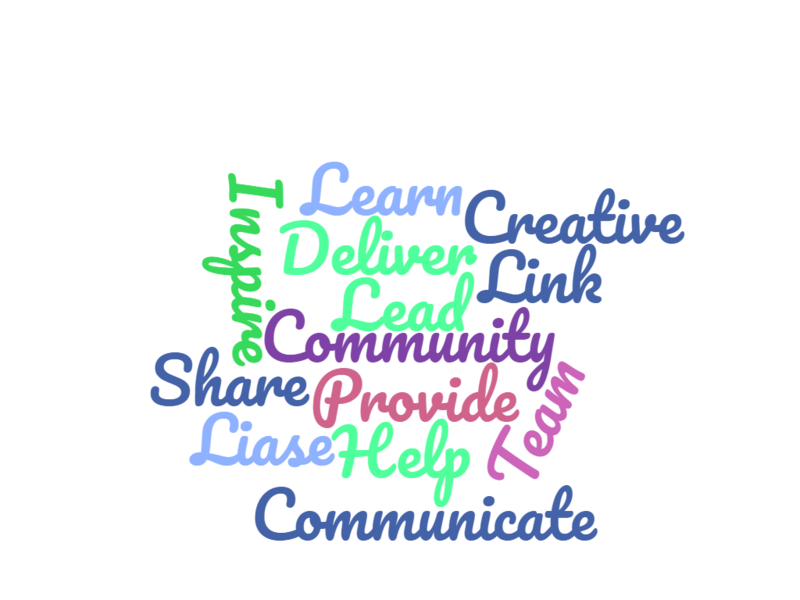 As well as sharing days between the TRS Teachers we also share props and ideas on our Facebook page, usually on a Wednesday, so keep an eye out HERE.